I've spent a long time ruminating over this one. I'm sure you lot are sick to the gills reading posts on folks opinions on the Age of Sigmar. The turmoil in the gaming community has been nothing short of apocalyptic over the last few weeks. I've tried to navigate these emotionally charged fracas without getting too drawn in, but the depth of feeling is apparent. I've come to the point where I think I'm ready to comment on it all, so here we go. Okay. For the duration of the post I'm going to dispense with the shield of non commitment and gnarly gamer cynicism. This is too big a deal to gloss over with middle of the road opinions. Ready? There may be tears. Warhammer is not just a game, for me. Now, there you go. I can hear eyes rolling all over the net, so let me qualify that statement. First off, Warhammer is not my entire world. I am married with a family, I enjoy sunshine and going outside, I can hold and enjoy a conversation about things other than gaming, my neck is hair free and I am a (mostly) jovial fellow. Warhammer is a hobby for me, and one I've heavily invested in since I was twelve. That's twenty nine years ago. As with most hobbies, a hefty dose of love has gone in there too, and we are protective of the things we love. The Old World and it's denizens has been, and continues to be (we'll get to that later) a ready source of inspiration and enjoyment for most of my life. At heart I'm most interested in the story, and it's depth and breadth have given me countless ideas for campaigns, armies, themes, characters, conversions and on and on. I've raised regiments of the undead for Morbius the Necromancer. I've assembled clans of fimir to fight for their Meargh and bands of madmen from the North intent on despoiling the soft lands of the South. I've fought against elves that danced around my warriors refusing to just die, annihilated scores of dwarves with dark magic, been trampled under the hooves of Bretonnian knights. I've trapped and torn apart mobs of orcs and landed longboats full of Norsemen on the beaches of Albion. I've made bitter enemies on the tabletop and stalwart friends in the pub after. You're probably getting to the point where you're saying "But you can still do all that. Get a grip Princess." You'd be right, I can still play games in the setting. I have plenty of plans to continue my adventures in the Old World and I'm an active member of the Oldhammer community. But, let me compare the end of the Warhammer world to the death of a favourite musician. I can still listen to their music, but it will always be tinged with sadness knowing I'll never see them live again, and they won't be making any more music, and the simple fact that they are gone. The death of Warhammer Fantasy feels like nothing short of losing an old friend. Our hobby thrives on social interaction. I've made a lot of friends through gaming, and several directly through Warhammer and mutual enthusiasm for the setting. From now on there won't be any more tournaments for 8th unless someone gets it together pretty fast and creates a central living rulebook similar to BloodBowl, the perfect example of a Games Workshop orphan that thrives. (The difference there is Bloodbowl only requires a team and pitch, not masses of ranked warriors.) The banter at tournaments is one of the main reasons to go. The conversations on various points of list building, army themes, painting techniques and the Warhammer background will begin to become more infrequent now as tournaments falter and folks drift away to other games. Thank the powers for Oldhammer. I still can't get my head around the decision to destroy the entire setting. I understand the business arguments and the zealous re-branding to create an indomitable IP fortress for Games Workshop. I do. It seems like one hell of a gamble though. Thirty years of lovingly crafted lore literally gone up in smoke. To me it seems like nothing short of vandalism. I've spoken nothing of rules, you may have noticed. The rules were always secondary to the setting for me, but I will miss them. The weren't perfect, 8th sometimes became a game of killer spells and killer combos, but in general it was a great edition. Hell, I love 3rd edition, but that has plenty of holes in it. The Warhammer rules had pedigree. They game could have done with an overhaul, but annihilation? Things must have been worse than we thought. Which brings us to the new incarnation of Warhammer, Age of Sigmar. When I first saw the initial images, I thought it was a joke. This looked like some serious He-Man action. There was even a Cringer some golden guy was riding. I grew more and more appalled as more and more news surfaced. Sigmarite? Bloodsecrator? Ayzrheim?! Aelfs?!!! But, in time I softened. I deciced to give Age of Sigmar a go. The Stormcast Eternals are growing on me. I actually like the liberators. The Khorne Blood warriors look like they should be in a Gwar gig, but that's a good thing in my book. The quality of the models in the starter box is pretty high, as you would expect from Games Workshop, but these are a step up even for them. I'm talking about technical quality now, not the aesthetics of the models themselves, which has folks divided. For myself, I think they are pretty great in an over the top high fantasy way. They're like a 1970s airbrushed rock album cover. Again, not a terrible thing. It's not a toothless Empire militiaman wrestling with a starving orc in the mud outside Nuln for a meaty bone, it's shiny. Super shiny. Ride the lightning shiny. The setting is pretty thin so far, are they on a planet? Are the eight realms magical? Where did all the humans and other races come from? I still have some reading to do. I want to like Age of Sigmar. I want it to succeed and answer all the questions we're asking it. No points? What about tournament play? What's with the crazy rules? What will happen to me when I bottle someone for putting his model on the scenic base of my monster to get in range? Okay, common sense kicks on for that one. I have to think of Age of Sigmar as it's own game, and not a continuation of Fantasy, as the grim and dangerous feeling I have about the detonation of the Old World and all that went with it may taint my perception of the new one. It's only off the blocks, this new game, so I'll give a fair shake and see what's coming. Games Workshop want to reassure us that they are all in, as the shiny new liberator statue in front of Games Workshop's headquarters testifies to. 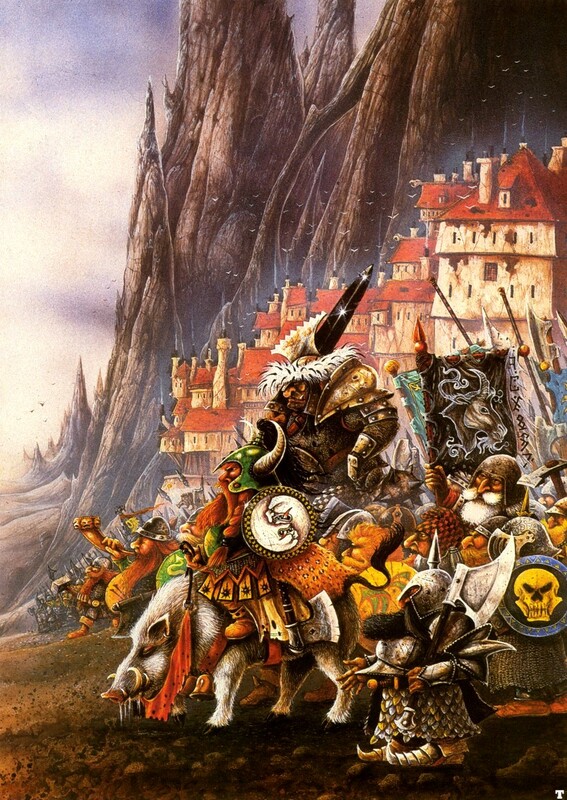 They could have just canned Warhammer Fantasy entirely. Let's give them a fair hearing on Age of Sigmar. I would give it a go, but so far it just doesn't interest me. Like you I'm a family man and hobby time is precious. I just don't see anything in the gameplay and ruleset that would justify learning the new game and getting into it. KOW offers a massed combat game with the cinematic appeal I'm after. I want the Battle of the Pellenor Fields, not the fight in Balin's Tomb. So I'm off to Mantica, or maybe the Warthrone of Saga. Add to that the truly horrific cost for the models here in New Zealand (NZ$100 for 5 Liberators, NZ$65 for a Lord Celestant), which means the game is almost certain to flop here, whatever GW thinks. I just can't bring myself to try it. But good luck and happy gaming to those of you who do and who enjoy it. I hope you have a blast. I may end of with KoW myself, or possibly Hail Caesar. Saga is a game I've been looking at for a few years, I have some Norsemen ready to rock. That's a hefty price tag for 5 plastic models. New Zealand really gets hooped for pricing. As the AoS world begins to flesh out, it looks more and more like you're right about it being a completely new world. And its a too-shiny world for me. I just hope they keep the old models going for a while. If I was to play AoS, I'd be very tempted to keep my existing collection for 3rd, or KoW or whatever massed battle game, and use the AoS models for AoS. The style is already pretty divergent from Warhammer Fantasy, though models like the blight kings straddle both systems I think. I can pretty much say I'm done and will likely go back to my old ways. That's just the modeling and painting aspect and not playing any games, not going to any far away tournaments. Yea I'll miss seeing the out of town guys, but I have better things to do than play a game that I don't enjoy. Besides that my life changed back in February. I can not hear well and sometimes at all in crowded noisy settings. I think you will see Warhammer disappear within a year just like Warhammer Ancients disappeared from a tournament setting when it was dropped outright. Was a great game. My local buddies and I will probably play Warhammer or some Oldhammer version, but it will be local, I don't see it ever being regional or national again, people will move on and play other systems. Speaking of which is exactly what happened to Warhammer Ancient Battles. There went from being one set of rules to over a half dozen upstarts, which fractured and already small community. There's no commonality to bring us together anymore except on a local level where we agree ahead of time and hash it out. That's incredibly difficult to do nationally, as it seems every region or city or whatever opted into a different rules system. I'm really sorry you're having problems with your hearing, I hope it's something that can be remedied. It was truly a shame about Warhammer Ancients, I really liked that system. Hail Caesar is a great ruleset though, I'd recommend trying that. I can imagine that if you're an active tournament goer then losing the social side of all that is going to be a blow. Nice analogy between the death of warhammer and a favourite musician too. If the 8th tournament community doesn't make it in your neck of the woods then hopefully the Oldhammer lot will go from strength to strength. I bet those fun, informal games take a lot less organising than a full blown tournament! Personally my heart lies with the toothless Nuln spearman wrestling with a half-starved Orc in the mud. I've been in splendid isolation from GW for quite some time now and the whole furor hasn't affected me. Hang on in there and hope you enjoy AOS! Sad but true, we'll be the last ones to carry the torch of fantasy. A dwindling band, forging on into the depths. I do like some of the things in AoS, but the high fantasy approach isn't one of them. As I've said elsewhere, too much magical gubbins, not enough body odour and honest toil with a battleaxe for me. Exactly. I can't see the Stormcast dudes needing a baggage train or having an ale after the battle while watching their mates stripping choice items of loot from the dead. Ahh... magical. I have no comment about Age of Sigmar but I wanted to make a comment this post. I enjoyed this well thought out and well written post about a fellow for whom, like me, wargaming is in the blood. Continue to do what you enjoy as the world will continue to change. Its a hobby and its what you want to make of it. Thanks very much Gavin, well said. Well said, chief - sensible and to the point. I have less intense feelings than many, because, to me, Warhammer died some time ago. The setting was primordial to me, but so were the figures and as GW went with bigger and more cartoonish figures I lost interest in the recent editions. So my grieving period was done some time ago. Having said that I think the "vandalism" comment you made is spot on. Why not just make a new game? Why destroy everything in the process? It reminds me I'm really not a fan of evolving timelines and storylines in RPG, Wargames and the likes. They always jump the shark at some point. I prefer the old Warhammer or D&D settings, where it was up to the players to forge their own stories. 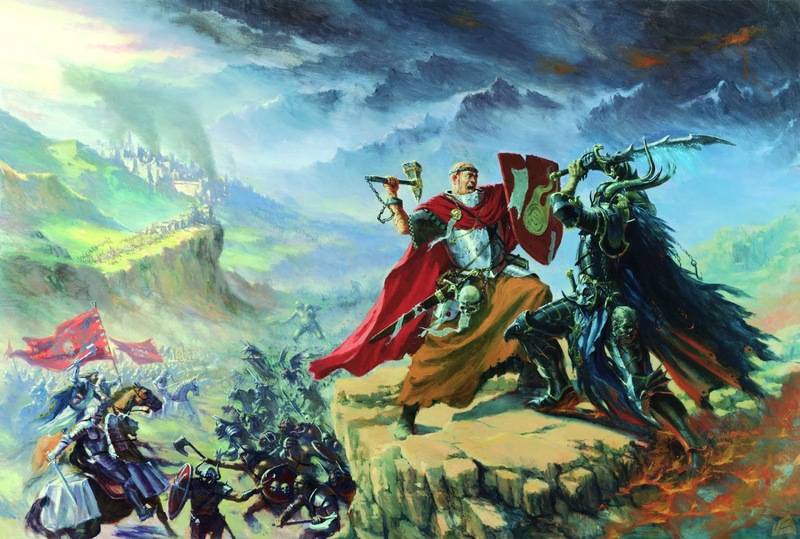 As far as tournament goes, have you thought of KoW? It's pretty obvious they will create rules for all the GW armies. I certainly think my heart lies with Warhammer around the time of 3rd edition. The figures, the lore, the rules and the humour were all in balance to me. That said, I imagine watching the newer editions was a bit like hearing occasional news about an old girlfriend. You're not together anymore, but you're glad she's doing well. Age of Sigmar was like hearing she'd been hit by a car crossing the road. KoW have produced lists as far as I know, I may indeed look into it. Hail Caeser is rapidly approaching the top of my list for the next battle game system to get into, it has a great group of folks behind it. Good read Mr S, I can feel the pain :-) (and that with no Slaneshi types about). We'll see what transpires AoS wise and look to Oldhammer which just expands to include 8th Ed perhaps. Don't worry, Slaanesh is just gone down the shops. Those keepers go through milk like crazy. A thoughtful and touching post, and I'm glad I read it. 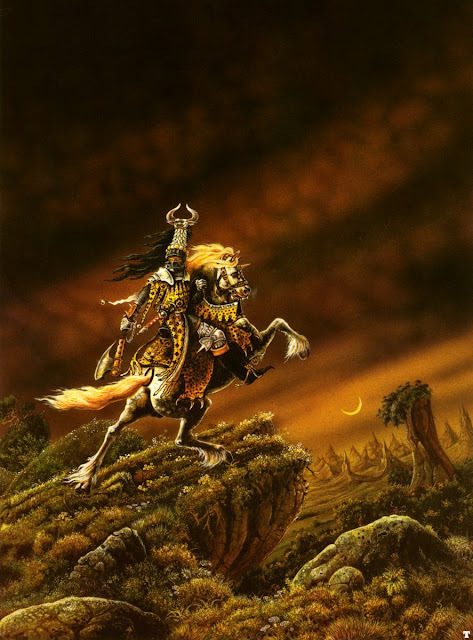 Too many thoughts pop up for me, but I also feel that connection with the Old World, although it was and is through WFRP more than the tabletop. So as a player and GM of a long retired system I haven't felt the change anywhere near as personally. Simply though, I get where you're coming from and I admire your optimism. Thanks Davey. It's optimism mixed with a desire to see the setting continue in some fashion I suppose. Speaking of WFRP, I have a marathon session coming up in a month or so with some old stalwarts. That'll be fun. Great read. Like yourself I have been into GW and Warhammer for many years - started with the Konrad books 24 years ago. I am treating Age of Sigmar as a new game as this makes it a lot less of a wrench, and I feel it deserves at least a fair shake of the stick. Additionally I like Warhammer for the pathetic aesthetic, but I am also a fan of the more high fantasy style which it is looking like AoS will deliver on. I think looking on it as an entirely new setting is the only way to give it a fair go. I hear you on the pathetic aesthetic. The more mythological style of Age of Sigmar separates it that much further, which in the end is probably a good thing so it can become it's own beast. I'm curious how the other factions will look when put through the high fantasy filter. Vandalism implies a degree of thoughtlessness, and GW are nothing if not calculating, albeit in a very cynical, cold manner. This is more like a burnt earth policy, allowing them to create a more easily controlled and defendable IP. This is the Edition change they've always wanted, writ large. I've never been much of a war gamer, WHFRP has always been closer to my heart, as well as D&D; and this stinks of the same misstep that Hasbro/WotC took when they brought out Fourth Edition D&D. That said, I feel the schism that happened there won't happen here- Old Grognards will just sadly turn their backs on GW and game on, leaving Age of Sigmar mostly to the newbies. I fear you're probably right. Let's hope they haven't completely misjudged it. True enough Bruce, true enough. I'm drawing what crumbs I can from the situation. It could have been like the specialist games, where support simply ceased, but they knew the backlash would have been formidable if they tried that with Warhammer Fantasy, well, at least more formidable than what we've already seen. We'll take ship to Valinor together then. I hear the boat has an excellent wargames room. Perhaps you should look at different rulesets. The Shattered Crown or KoW. Its very sad I felt the same when they turned everything into Specialist games especially Necromunda. They mothballed so many great games. Necromunda remains a firm favourite of mine. Scavvies FTW. I am an RT nut myself, so that's some consolation. I used to joke that GW wanted to put space marines in fantasy. The joke is on me now. I don't hate the stormcast guys, the liberators are actually pretty nice, but I do hate the policy that created them. GW will need to be careful about becoming Space Marine Workshop. All eggs in one basket and that. 30 years here.. lovely post..
That's excellent, thanks for the link, I'll certainly take a look at that. For anyone who has read End Times volume 5, the Joshua Reynolds editon in novel form... We, the survivors of this corporate apocalypse, remain frozen in time (and space) in a Time of Legends. Ooo. I have the 5 End Times novels, that's very intriguing, I'm looking forward to seeing what that entails. 8 books eh? That should keep me busy. Having read none of the Gotrek and Felix books, I am keen to start at the beginning with those. As with yourself, I have a backlog of Warhammer Fantasy reading that was now become a finite resource, so I'll get to it in time. I have waited nearly 2 years to comment as I wanted to give it a fair go. I have done so. I will keep my old Armies I do not need anymore GW figures anymore. I refuse to play another game of Age of Sigmar. The lore was destroyed and they need not have done it in the way they did to protect their IP. I have seen IP Boilerplate protection actions and this was one of the most poorly executed I have ever seen. Farewell Games Workshop. I am not saying farewell to Warhammer as I have every edition ever published including the original boxed set of rules. I own most of the fantasy novels and every White Dwarf issue since Issue 73 until the ridiculous publishing scheme came out 2 years ago. David I love your Blog. Thank you for the service you provide. P.S. I am still playing and buying 40K Miniatures and have renewed my WD subscriptions since they have come to their senses. Hi Andrew. It's interesting looking back over this post now. I feel much the same way now as I did then, though AoS has grown rather prodigiously since then. It seems the community has uncoiled somewhat since the trauma that was the death of Warhammer Fantasy. For myself, expansions like Age of Sigmar Skirmish and The General's Companion give me a lot of fodder for the kind of games I like to play. It's very open ended, so I can tailor it to what I like for little effort. I will be building round base warbands for skirmish and Paths to Glory, but I won't be re-basing my fimir. I intend to add to them, in fact. There does seem to be a real effort coming from Games Workshop to accommodate players. This new Games Workshop appears to be listening to the player base and giving us what we want. Hell, Genestealer Cults? Long may it last. However, the world of Warhammer or 'the world that was' is still far superior to the mortal realms in my mind. Granted it had decades of lore poured into it, so a comparison might not be entirely fair. The high fantasy setting, while much fun, doesn't hit my sweet spot the way the Old World does. I know it too well. There's no reason one can't take the new rules and use the Old World as the setting of course. By contrast that does make the super open-ended and largely unexplored mortal realms a fun environment to play in. Thanks for the kind words about the blog, by the way!